Upon her return to Japan after a two year study break in Paris, Ichigo Amano is met with news of Team Ichigo's separation, as each of the Sweets Princes takes a different path toward their dream. Now in her first year of high school, Henri Lucas has a project in store for her, enlisting the help of Ichigo, Makoto Kashino, and new members Lemon Yamagishi and Johnny McBeal to give rise to a new Team Ichigo. As the four work together on this project, Ichigo and Makoto continue to grow closer, though Johnny and the unrelenting Miya Koshiro will not idly sit by; with Johnny's eye on Ichigo and Miya still after Makoto, it definitely seems like love won't come easily. With Ichigo's time at St. Marie Academy, she is now ever closer to her dream of starting her very own pâtisserie. However, she will soon realize that it takes more than just making delicious sweets to open up a shop. 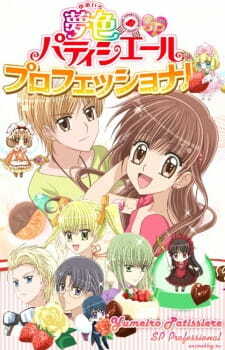 Ahh, I really really did love Yumeiro Patissiere but when I watched Yumeiro Patissiere Professional, I was a little sad. C) They didn't show how the romance between **SPOILER** Kashino and Ichigo started **END OF SPOILER** That makes me really annoyed and I was like, "What?? When??" They should have do it slowly how Ichigo started to reciprocate her feelings for Kashino. Story: It was so-so. I wasn't convinced. Basically to me, it's like a repeat of Yumeiro Patissiere season 1 except, shorter. The addition of Maize and Johnny was really funny! It made the series really interesting because just watch it and you will get what I mean. Johny is TOO funny. The way he speaks and all. But I'm a bit bummed up that Team Ichigo split up. When they were together, you can feel that they really did work as a group and tried their best together. I miss that, a lot. Short but still alright, worth a watch. Where to begin with this? I'm not quite sure, but as an immense fanatic to Yumeiro Patissiere, I have to admit I was quite disappointed by this series. Not that it was bad. No. It's just not as memorable as the first season. By far, I think that this majors specifically from the fact that the first season is 50 episodes. When they announced the second season, I was ready for another 50 episodes. Is that what we got? No. In fact, we didn't even get 26. It was the meager number of 13. I mean, at the end I was screaming, waiting for a preview for the next episode. No, that's it. That aside, there are many downfalls to this anime, which made me a bit sad. But I think it's fair to say Yumeiro Patissiere SP Professional is simply a normal anime. Nothing about it particularly stands out to me like the first season, but that doesn't mean it's bad either. I think the main thing about this series was the fact that I didn't find the series all too exciting. Prior to this season, Yumeiro Patissiere was focused on a group of 14-year-old teenagers who strive in competition in order to overcome rivals and win 2 years to study abroad in Paris; which they accomplished. I think the whole setting of Grand Prix events was just nail-biting torture at some point. There were moments where you really were just begging the characters to overcome their obstacles. Not so much in Yumeiro Patissiere SP Professional. Compared to the first season, the story is very laid-back, to the point where half the series seems to just be filler. The main premise of the story is the fact that Ichigo and the gang are starting up a patissierie. To be quite frank, this premise is only important for the last 3 episodes of the anime! The 10 episodes before it center around different people and all their problems to which sometimes you just sigh and wonder when they are ever going to get to the actual point of the anime. For that, I find it necessary to give YPP a score of 7 for their story compared to YP which received a score of 8, because it just wasn't as exciting, quite frankly. The art is basically the same as that of YP. Though, if I were to critic anything on it, it would be the strange way all the characters seemed to grow up. The anime takes place 2 years after the end of the first one. I find it odd how the characters look in the second season. Ichigo and Kashino look fairly untouched, all they are is just taller, with the exception of less baby fat on their faces, and Ichigo's hair being grown out. Which is fine because they are the main characters. What I find odd is the character design of Andou and Hanabusa in the second season. Both seemed to grow their hair out (which to be fair is in a different way), but it just seems so awkward. Though I do agree, the whole point was to make them more mature. Which makes sense, because they did spend 2 years in Paris, and it's only correct that they would mature in the time, but it seemed as though the character design was almost halfheartedly done. I'm fairly certain in YPP, they used the same soundtracks they had used in YP, and like I said before; the OST to Yumeiro Patissiere is solid. Though, the opening and ending themes did change. The opening theme "Sweet Romance" by Mayumi Gojo (who also sang the theme song to the first season) is a nice change. It being the first thing you see and hear from the new season, it gives the feel that this anime is now centered on romance (to which it's fair to say it is) and the sound is definitely more mature, also reflecting on the time skip in the anime. The ending theme "Home Made Happy" by Primaversa was a nice fluffy way to end each episode, which was fine. Though, if I were to choose, the opening theme was much stronger than the ending theme. Over the course of the two seasons, I think that the characters were actually stronger in the first season than in the second. Partly because some of the characters in the second season just annoyed me to no end. Amano Ichigo, from the first season, you know her as a clumsy, optimistic, slightly clueless girl. Not so in the second season. Yes, she is still clumsy (often falling down or other ridiculous things), but the thing is she has nothing that makes her stand out. After being in Paris for 2 years, trained by Henri-sensei no less, she actually had baking talent. Her character from the first season lacked that. But for some reason, Ichigo's character seemed rather bland in the second season. Sadly enough. Kashino Makoto stayed relatively the same, with the exception of, if it were possible, I think he got cuter. He was the only character I actually adored just that little bit more in the second season than in the first. His character is the same, that prickly, impatient, unsociable character, however, after the course of 2 years, his love for a said brunette is quite more obvious. He tends to become flustered when it is pointed out to him, and he's much more open to Ichigo in the second season than in the first season. I think what really sells it is his possessiveness over Ichigo. He gets very jealous of others when it comes to her and often protects her as if she is already his. The other characters are basically the same for the little screen time they have. Andou and Kana are given a little bit more character development, which is nice. However, there are 2 characters that really made me angry throughout the whole series. Johnny McBeal and Koshiro Miya. Just when you thought Koshiro couldn't get any more annoying, she did. In fact, her and Johnny paired together were just incredible sores to the story. I'll be quite honest, it seems like their whole purpose is to be plot devices. Which is sad, because they could have at least made the plot devices likable. I think the saddest thing of all is the fact that this anime centers around Kashino and Ichigo and nothing really happens with them. They are constantly hinted at, stressed, and you even think something might happen to them, but it never really happened. And I think that just frustrated me. Other than that, the series was relatively boring and while fluffy and cute, just didn't leave the same impression on me as the first season did. Averaging all the separate scores together leaves me to conclude that Yumeiro Patissiere SP Professional is deserving of it's 7/10 score, compared to the one I gave to the first season of 8/10. The series is overall decently done and is fun to watch; especially if you want to lighten your mind after watching darker themed animes. But all in all, I think fanatics of the first season will be disappointed. Much like I was. But nonetheless, it was worth the time to watch it. I watched this anime and it's predecessor when it first came out, and I decided it would be better to review this once I got a bit older, and started to see things differently. A great decision if you ask me. You'll see why. I did not really enjoy this, but it made me appreciate season 1 a lot more. This season was purely a wish fulfillment for kids who wanted to see romance, and a failed one at that. The romance was forced and cringe-worthy, and now I'm happy that they didn't show the kiss. The main "couple" was void of chemistry and compatibility, and only caused each other more problems. Its kinda sad, since when I was younger, Ichigo and Makoto seemed like the ultimate OTP. Moral of the story: If it hurts, don't do it. First of all I am kinda disappointed with Yumeiro Patissiere Pro. Even though the atwork improved quite a lot (Kashino becomes much more cool! ), i still think the first season is better because i think the plot is more clear and the story is more exciting, like u're waiting what'll come next? The story in the second season is kinda boring and it does not leave many impression in me. The story just revolve around the cake business and stuffs. They does not even include any school life except for episode 1 (that too so little). It seems like the story is divided into parts which are somehow not related to one another. To say it straight the story is not that much interesting.